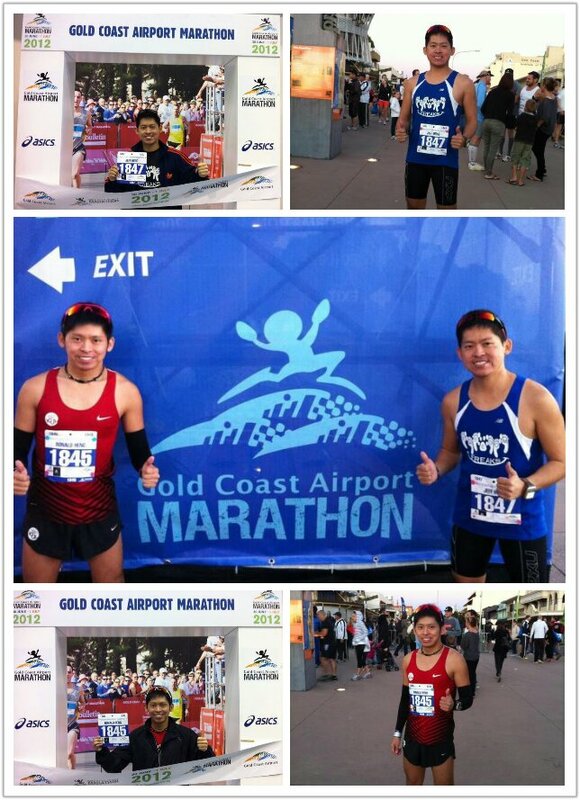 Before I begin, my brother Jeff and I would like to take this opportunity to thank Team Freedom Freaks for their great supports and encouragements by spending their precious time in sending both of us at Changi Airport for our Gold Coast Marathon trip on 29 June 2012 (Friday evening). Many thanks to you guys! 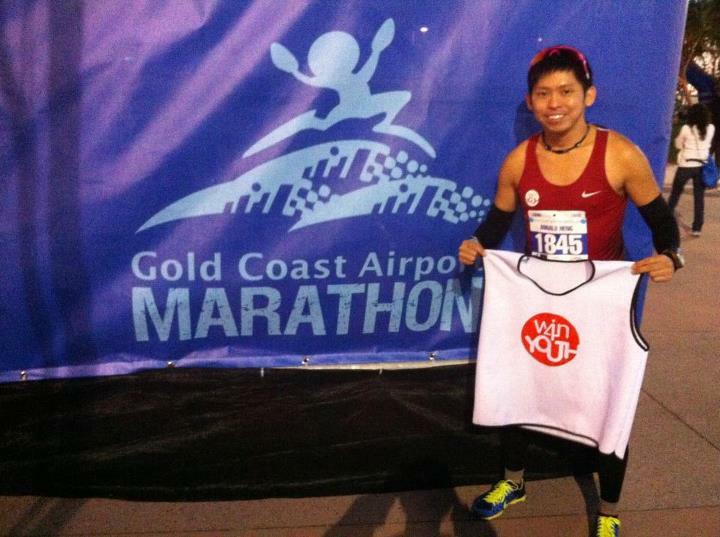 Together with some Singaporean passionate runners and our group leader (Sky Khoo), Jeff and I reached at Gold Coast Airport (Australia) at approximately 5:30 AM (Singapore Time 3:30 AM) and the flight journey took us 7 hours. The weather was very good and cold with blue clear sky with no clouds. 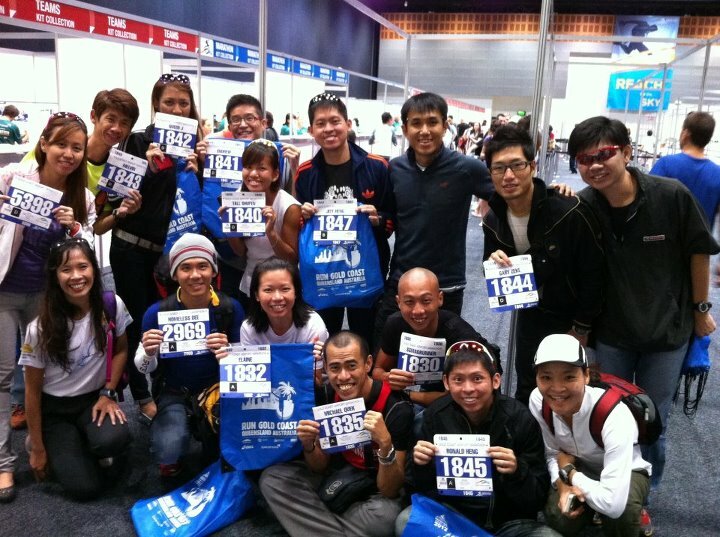 After we have collected our check-in luggage in the airport and settled our breakfast meals, we then straight away went to the Gold Coast Convention Centre to collect our race goodie bags and bib slots at the race expo. Few hours later, all of us then left the place for our backpacker resort (Sleeping Inn) and settled our accommodation stuff. In mid afternoon, Jeff, Sky and I went for our jogging session 3.17 km around our resort area to condition our bodies to the cold weather. Very happy feeling! I was very excited to run my first marathon race in a cold country like Australia. This marathon race is to dedicate my effort to Adecco Win4Youth project in raising charity fund to help and integrate young & needy people into work, in difficult environments. Soon, the marathon race started at 7:20 AM. Sky, Michael Quek (another good buddy) and I started our runs together and we paced together closely from the start. The cold weather was so good that we ran and reached our 25 KM and 30 KM markers in 1:58 hours and 2:25 hours respectively. However, my body was starting to complain and feel fatigue at 28 KM. Eventually I hit my wall at 31 KM. 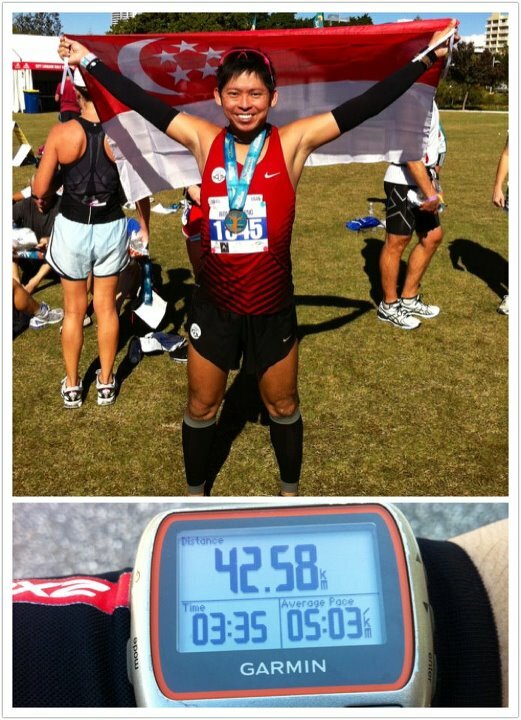 Sky was with me and he encouraged me to maintain my pace to 5:15 mins/km in order to achieve sub 3:30 hour marathon time. I told him that I cannot run anymore and asked him to carry on his run and not to wait for me. I stopped, rested and did some leg stretching for about 1.5 minute at 31.8 KM marker. Suddenly, I was able to run again at 32 KM with an average pace of 5:30 to 5:45 mins/km. 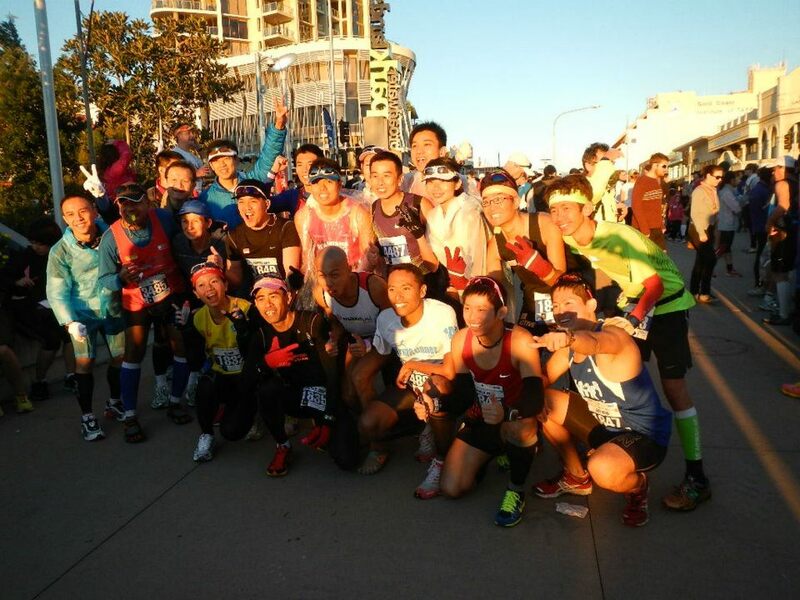 This was awesome feeling because I felt the encouragement supports from the local supporters and runners. 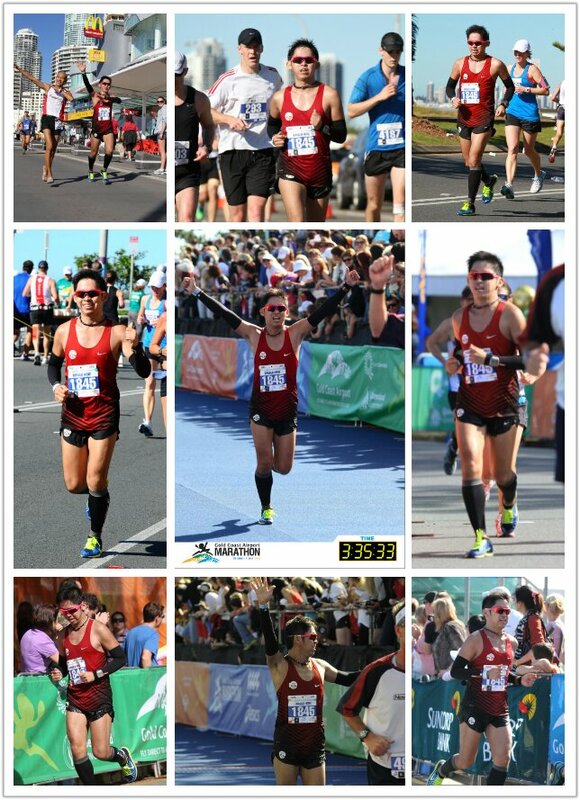 Finally, I raced and completed my Gold Coast Airport Marathon 2012 with a net time of 3:35:33 hours (Season and Personal Best). My marathon has improved by 15:55 mins from my previous best time of 3:51:28 hours set at Standard Chartered Marathon Singapore 2011.